During the Wilson celebration, children will walk on luminary-lighted paths around the campus, seeking shelter for their group. At the end, they will find safety in Laird Hall, where a celebration with prayer, music and authentic Mexican food provided by Veroni Cafe, Chambersburg, will conclude the Las Posadas celebration. Learning Campus, Wilson’s after-school tutoring program for migrant children, is hosting and co-sponsoring the celebration, along with the Wilson College Choir, Spanish department, Spanish Club, Muhibbah Club, Learning Campus Club, chaplain’s office and the Office of Student Development. 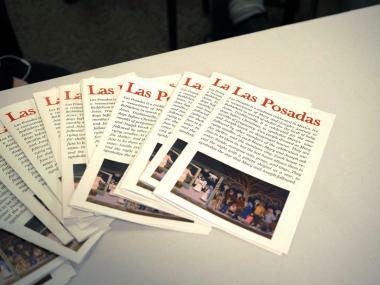 Learning Campus sponsored the first Las Posadas re-enactment on the Wilson campus in 2017.